The Data Repository is comprised of a backend component and two cloud application user interfaces: (1) the storage and retrieval repository and (2) the team management module. The uploaded files are stored in a centralized file system within the repository. Individual organizational units are defined by three data storage components (drug, project, study). 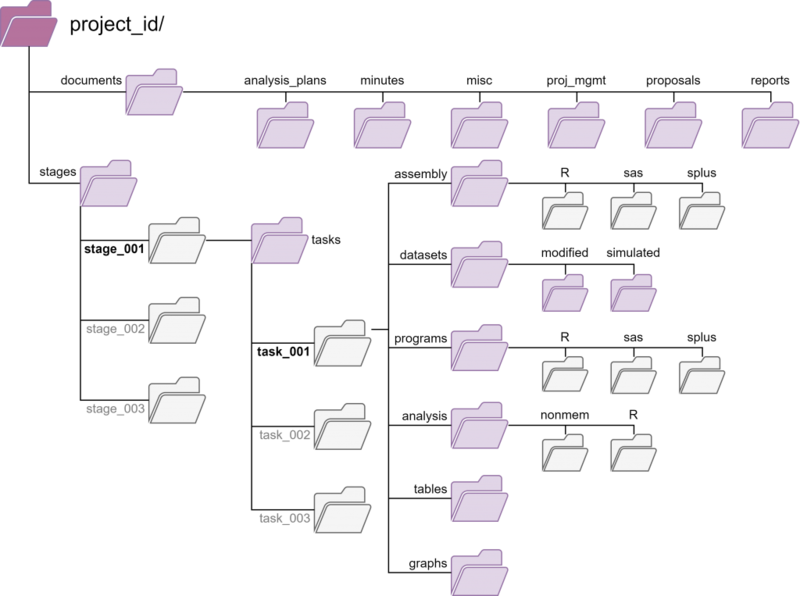 The type of data storage component determines the directory template that is used to organize files; this directory template structure is automatically generated when a data storage component is created. The folder structure template is mapped to a permission matrix, which defines the user roles which can access and perform actions on files within a given data storage component at a given file path location. 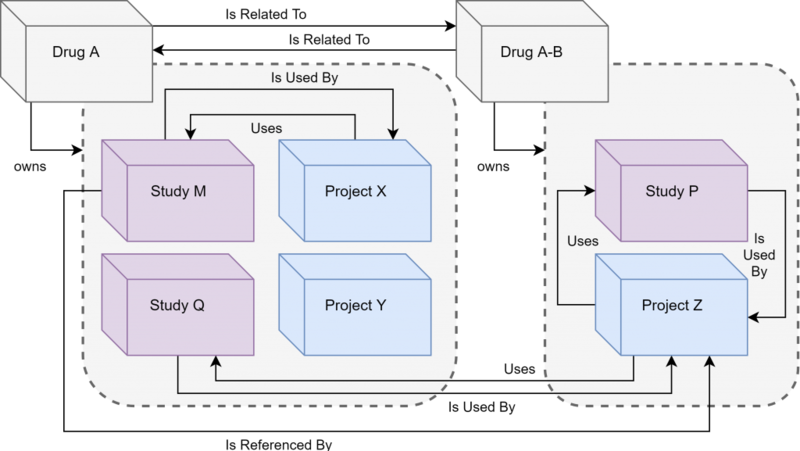 Relationship linking functionality was developed to allow data storage component items to display relationships defined by administrative users, to facilitate the identification of relationships between drugs, projects and studies. The team management module allows system administrative roles to manage the system and oversee data storage components, users, roles, and team assignments. Teams can be associated with one or more data storage component. 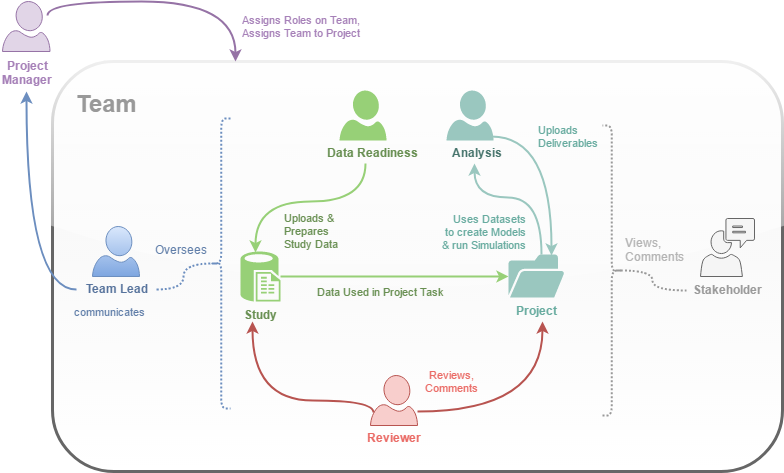 Teams can include users from the same organization or disparate organizations, whilst retaining permission-based role collaboration within the Data Repository. Each user within a team is assigned a team role, which enables the user to perform specific actions. Actions can be described as functions that can be performed within the various data storage components. Users can upload and perform tasks on appropriate files on their assigned Drugs, Projects, and Studies. User actions are specific to their role and permissions and each user role has a pre-defined set of these actions that can be used. Version control using Git™  was implemented to allow detailed tracking of file version and metadata changes, as well as actions performed. The import functionality allows administrative users to review and revise location and file metadata information in a staging area prior to the commitment of the file to the Data Repository. Actions performed within the system are recorded in system logs for traceability, and authorized users may add comments to each file. The Data Repository is a cloud application with a user interface which allows users to manage and browse files and associated pharmacometric metadata within a pre-defined directory structure stored in a version control system. The Data Repository has a hierarchical structure to control organizational, team, and user access to shared data files. Users have assigned roles that enable specific actions unique to their roles and permissions. The Data Repository serves as a collaborative platform for knowledge accumulation. The Data Repository gives the repository owner the ability to control user access to shared data files through the use of teams and user roles. The Data Repository increases the efficiency of data curation and retrieval and increases the ability to communicate and share pharmacometric analysis files in a secure environment. 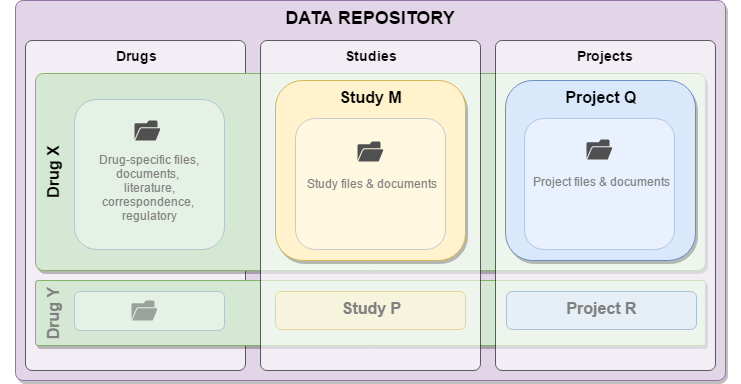 The Data Repository module, part of the KIWI™ Platform, is a cloud application with a user interface which allows users to manage and browse files and associated pharmacometric metadata within a pre-defined directory structure stored in a version control system. The Data Repository has a hierarchical structure to control organizational, team, and user access to shared data files. Files are divided into logical organizational units that represent a Drug (an intervention), a Study (preclinical or clinical trial), or a Project (which can include an analysis of one or more studies). Teams of users are assigned to each Drug, Study or Project by administrators using the team management tool. Drugs, Studies and Projects can be linked to map and track relationships, such as noting a Study with data that is utilized in an analysis Project. The Data Repository allows for flexible but granular permission control. Users are assigned to specific roles within teams that allow them to perform a set of actions appropriate for their role. Detailed descriptions of all roles, actions, and permissions are available in the Data Repository User Manual. The following role represents an assignment for a pharmacometrician, clinician or modeler. Analysis team members perform pharmacometric and/or statistical modeling and simulation work. Analysis team members have access to datasets and can produce documents, files, and additional datasets as a result of their workflows. Uploads modified and simulated datasets to assigned Projects. Uploads tables, reports, graphs, and other deliverable files to assigned Projects. Communicates with Team Lead regarding status and coordination of data. Communicates with Data Manager (if available) and/or Data Readiness team members regarding data issues. Can upload documents and other files to assigned Drugs, as appropriate. The Data Repository uses Git™ to version control uploaded files to track changes and allow detailed audit records to be generated.